Gaming monitors were expensive in earlier days, but now we have many models which are cheaper and anyone can afford. 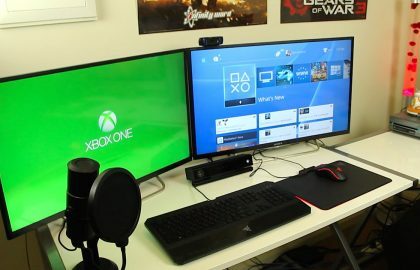 But the problem is to choose the best & cheap gaming monitor from thousands of products. To ease your search, we list the best budget gaming monitors categorized according to features and price. 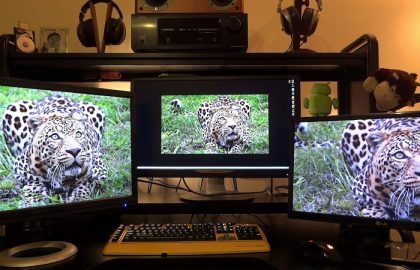 These monitors are cheap yet deliver high performance. These monitors can be used for multimedia editing and professional works also. One of the most popular gaming monitors currently available in the market which meets your demands because of its low price and special features. I will throw lights on the design, features, and performance of ASUS VS248H-P which makes you choose easy. A simply good-looking monitor with black exterior and no-frills stand. The entire unit is slim design with a 24-inch display housed which makes it perfectly portable. The bottom right-hand side of the monitor consists of a function strip which features the control buttons. The control buttons include Power, Brightness, Menu, Inputs and so on. The front sides are filled with labels and the physical buttons are situated underneath the monitor. It weighs 9 pounds and measures 22*16*8 inches and comprises of a plastic case build. The monitor is VESA Mount compatible. It is specially designed as gaming in mind with a resolution ratio of 1920*1080 full HD display. The aspect ratio is 16:9. One of the specific feature if this system while comparing to the similar ones are it poses a low gray to gray pixel response time of 2ms which brings all excitement to gamers. The TN panel, one of the major panel technologies which ensure fastest response time measures a maximum brightness of 300 nits. It operates at standard 60hz refresh rate and has a dynamic contrast ratio of 50,000,000:1. This model consists of HDMI, VGA, and DVI input options. It has got LED backlight technology and horizontal refresh rate of 83 kHz and vertical refresh rate of 76 Hz. While comparing to other similar ones as I already said due to its TN panel with 2ms pixel response you will get the fast-moving games without any motion blurring. You can probably notice the occasional screen tearing due to the low refresh rate of 60hz. If you are going for a 144hz monitor it will be an apt solution but will too expensive. VS248H-P produces excellent color reproduction and viewing angle when compared to some other TN angle products. As I specified earlier one of the drawbacks of this product is some quality control issues like color reproduction and excessive light bleed issues which were reported by some users. It was not to a large extent and if you face such case you can return your unit to ASUS. It comes with two of the major ASUS features namely; ASUS smart contrast ratio and ASUS splendid video intelligence technology which enhances sharper images while in a dark video and ‘quick image setting’ ie easy access to monitors physical buttons respectively. 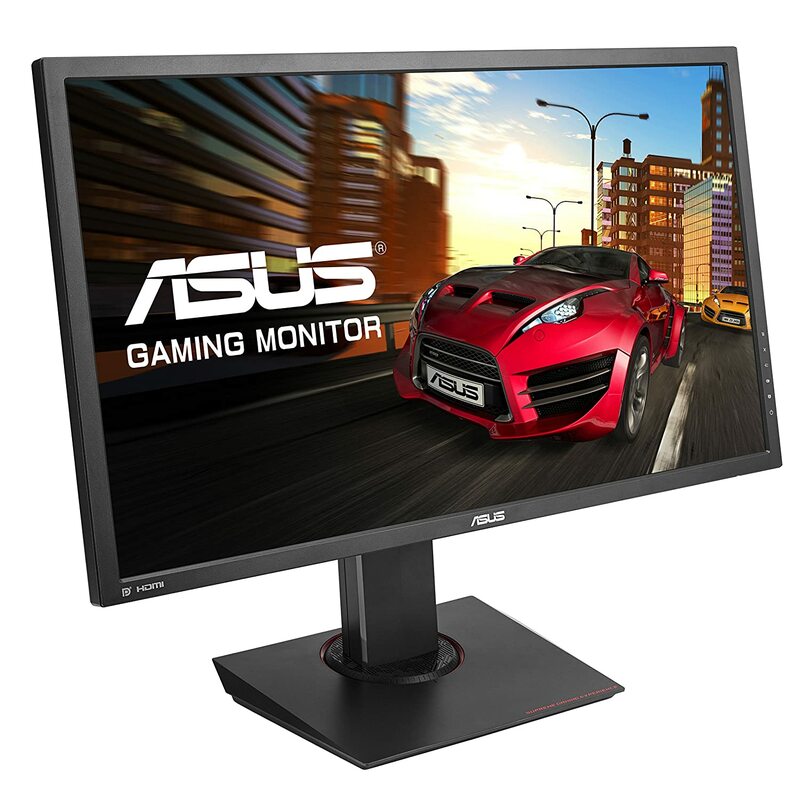 The ASUS VS248H-P is one of the most popular and perfect monitors for gamers. The affordable price and great specifications make it one f the prime choice for gamers. It has got excellent quality pictures and the response time makes the reproduction of quick movements at its best. Dell 24 S2417DG comes up with a glossy black design with a sleek silver base. Overall, it doesn’t look like a gaming monitor rather than it looks more like just as home in your office. The movement option for the monitor is excellent with 45 degrees left or right, a tilt option of 21 degrees and 5 degrees backward and forward respectively and raise and lower it about 6 inches up or down. Another feature in its design part is it can easily swivel into portrait mode. The display inputs consist of HDMI and display port. In addition to this, you have got two USB 3.0 ports and one USB 3.0 Type-B port in the back side of the system and left panel comprised of two more USB 3.0 port as well as headphone jack. The main menu is in black and white color and is a lot cleaner than most of the gaming monitors and the on-screen interface is very intuitive. Two programmable shortcut keys which can adjust the volume and display modes and it give quick access to brightness and contrast. The Dell S2417DG monitor is vibrant, smooth and very interesting to play games on. The monitor size is 24 inch, 2560 x 1440 screen and an excellent refresh rate of 165 Hz. With my gaming experience with Dell, I didn’t feel any hint of input lag because of its excellent refresh rates. The colorful crowds of characters are excellently visible in this monitor and another blue and red outlines around each character look good with its extra rich RTS settings. The average brightness of the system is 284 nits and a Delta-E-color accuracy rating of 1.88 which is better than ViewSonic XG2401 and Asus MG278Q.It produces a strong 122.8 percent of the sRGB color gamut, which is far better than its competitors. 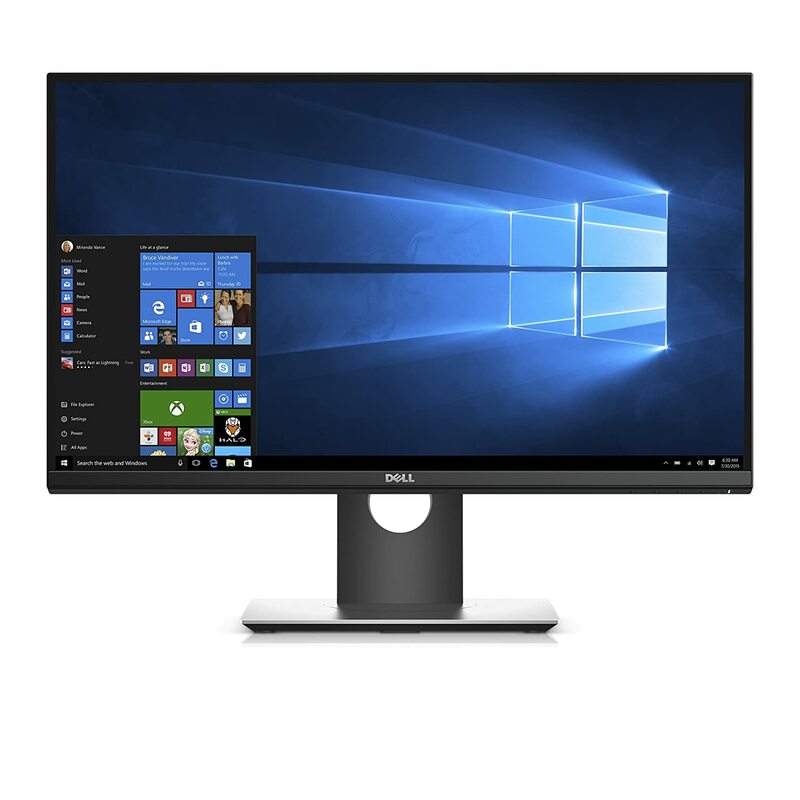 If you are looking for a 2560 x 1440 monitor, the Dell S2417DG is the best as per my choice. Considerably affordable budget, you will be getting a 1440p display with useful game modes and Nvidia G-Sync support. The differentiable feature is you can’t find much more option in 24-inch monitors with this resolution. As you all know Asus is one of the major manufacturers of electronic devices which are diversified into various areas. 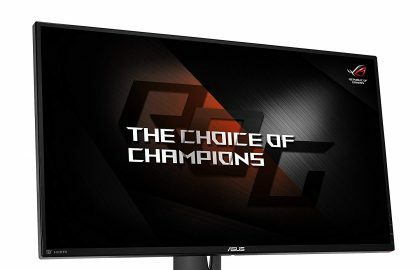 Asus is one of the premium brands when it comes to Gaming Monitors. 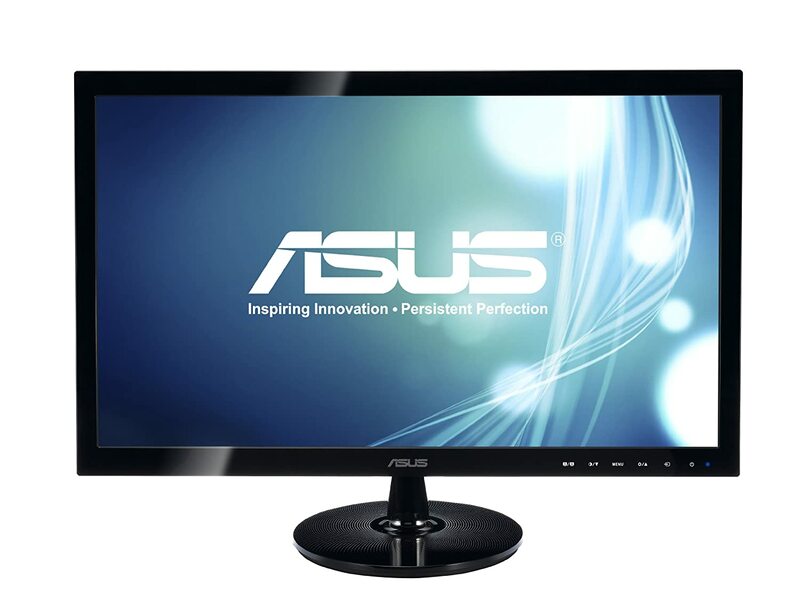 Asus MG28UQ is a 28-inch ultra HD Free Sync monitor which is a fast moving product in the market because of its unique specifications and affordable price. In recent days when you go for ultra HD displays, you definitely found 28 inch TN category to be the value leader and ASUS MG28UQ has sprinted far away from Acer XB280HK and AOC s U2879VF to became one of the leading products in the market. Let me take you through its features and specifications for an easy buying. While comparing to other devices it doesn’t look so stylish or flashy, but it comes with a beautiful matte black body. The gaming suggestive is ensured with a red strip outline on the monitor and two accents along its back. It comes with a tail narrow rather fairly strong support stand and thick display edge bezeling which gives ASUS MG28UQ a clunky appearance. When it comes to the rotation part you can easily swivel the base of the monitor to 60 degrees in either direction and the display can be pivoted to 180 degrees in portrait and landscape modes. The tilt adjustment for the bottom part to 20 degrees outwards and 5 degree inwards makes the vision good for gamers. The left side of the monitor is comprised of all connectivity ports makes it easy to reach and comfortable for the gamers. Two gamer-friendly features are added in Asus which makes it useful for gamers. The most prominent ones are Asus own Trace free technology and for visual sharpness and Adaptive Sync technology for display and GPU synchronization of frame rates. When it comes to the display part, to be frank, it isn’t the best one of complex high varied color values. The maximum color space coverage is 96% for SRGB Spectrum and only 74.6% in AdobeRGB measurements. But most of the above-mentioned drawbacks are overcome when it comes to luminance and contrast in comparison with other gaming monitors. The peak brightness of the monitor is just over 300 nits with a maximum contrast ratio between 680:1 and 780:1. 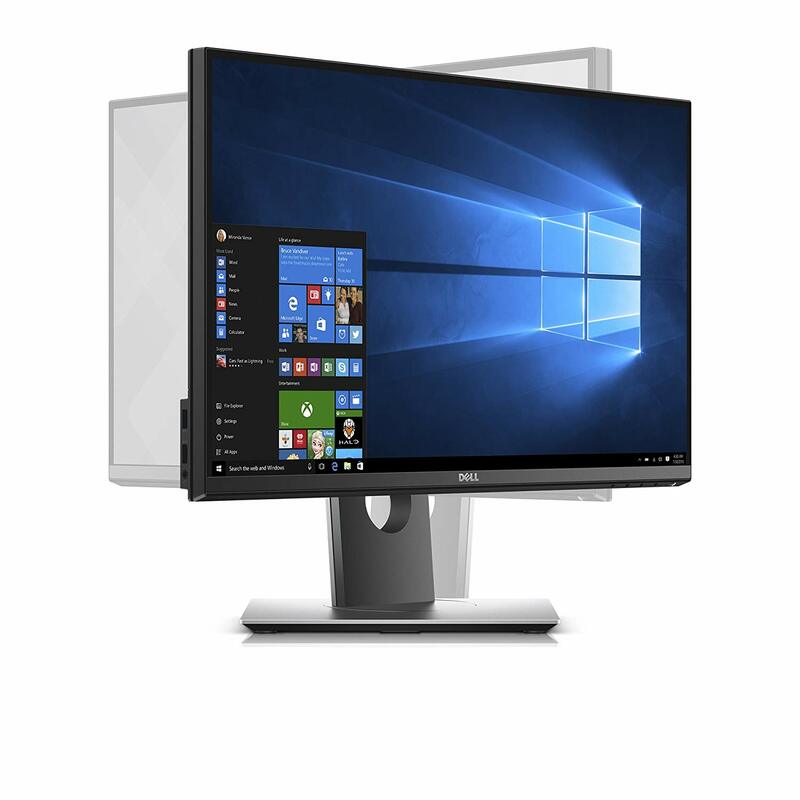 For a mid-range, 4k monitor ASUS MG28UQ won’t disappoint you a lot because it comes with a nice solid design and a strong support stand. The control menus are very easy to access as I quoted earlier and has got an excellent viewing option with its display adjustments. The calibration performance of MG28UQ is superb wit on-screen menu controls joysticks. Excellent extensive settings are available for tweaking which helps in contrast, color, brightness settings and resolution adjustments. It has got all important connectivity ports which are mentioned in the specification part and makes MG28UQ robust. In the software design part, MG28UQ has got very useful 5-way joystick control that is attached to the back of the display. This helps to navigate through these monitors on-screen calibration menus. One of editors choice of gaming monitors because of its easy connectivity, affordable price. I would prefer the monitor for beginners. The peculiarity of GL2760H is its widescreen. It is a 27-inch monitor that offers high-quality picture in widescreen experience at an affordable price. It provides excellent contrast and brightness and the Twisted Nematic feature (TN) produces a very fast response time. This is one of the highly demanded gaming monitors in the market. Let’s go through the features and specifications of the system so that you can make an easy decision. 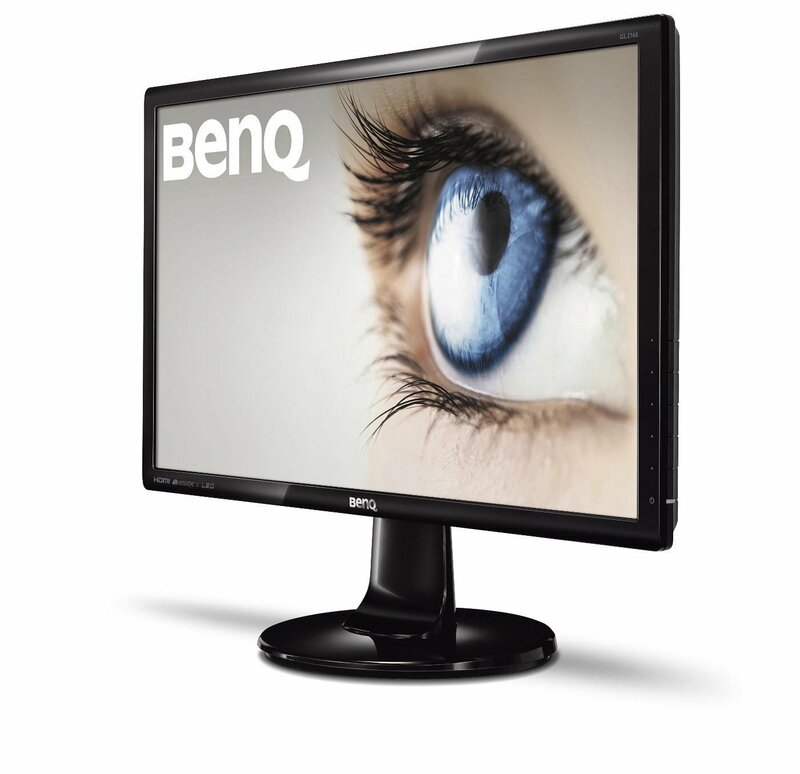 The GL2760H is the bigger version of BenQ GL2460HM in its features and design. It comes with a glossy black design and the 11-pound cabinet is 2.1 inches thick and has thin (0.6 inches) glossy black bezels. The base of the monitor is round in nature and you can tilt it 20 degree backward and 5 degree forward. One of the drawbacks in the design part is it lacks height, swivel and pivot adjustments. You will experience a brightness rating of 300 nits with 1920 by 1080 TN panel. The panel is non-reflective and is of anti-glare coating in nature. In the connectivity and port part, the video port includes DVI, VGA, and HDMI inputs but it lacks display port or USB connectivity. Next, to the video inputs, the headphone jacks are located. The power button and the five function buttons are located behind the right-hand bezel. 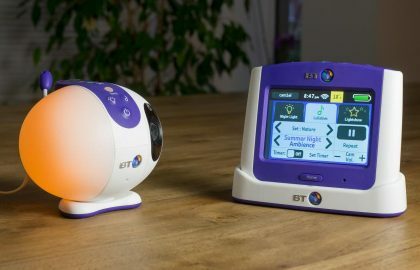 It is equipped with BenQ Low Blue Light Feature which helps o reduce the number of blue light emissions, and you can access the same in the uppermost buttons. The adjustments of brightness, contrast, Sharpness etc can be accessible in the menu button itself. It comes with a three-year Warranty on parts, labor, and backlight. While taking the display part it has no trouble in displaying the light shades but when it comes to the darkest shades it appears little bit black in nature. The color accuracy is skewed in the case of GL2760H ie, you can see green is of much wider margin and red and blue are just outside. Because of the above color skewing GL2760H does not suffer from tearing but if you like to have accurate colors you will be a bit disappointed with this monitor. A crisp HD imagery is delivered by the 1920*1080 TN panel mostly on a straight view but when you move the panel 60 degree to either side you will experience a slight trace of color shifting. The input lag is of 9.9 milliseconds which is the lowest we have seen. If you have the lowest input lag the better chance you have of getting the drop on your gaming opponents. The panels 2ms pixel response is stutter-free and smooth. The GL2760H used 13 watts power on eco mode and 32 watts power on Standard mode which is on par with BenQ BL2710PT. Ports: HDMI, DVI, VGA, 2x USB 2.0, Audio line out. A solid choice for gamers who are looking for a 27-inch monitor. Even if its viewing angles and color accuracy is not competitive while comparing to another similar device it delivers excellent sharp image details and grayscale reproduction. Another important feature is the speedy pixel response and low input lag provides smooth gaming and video performance. 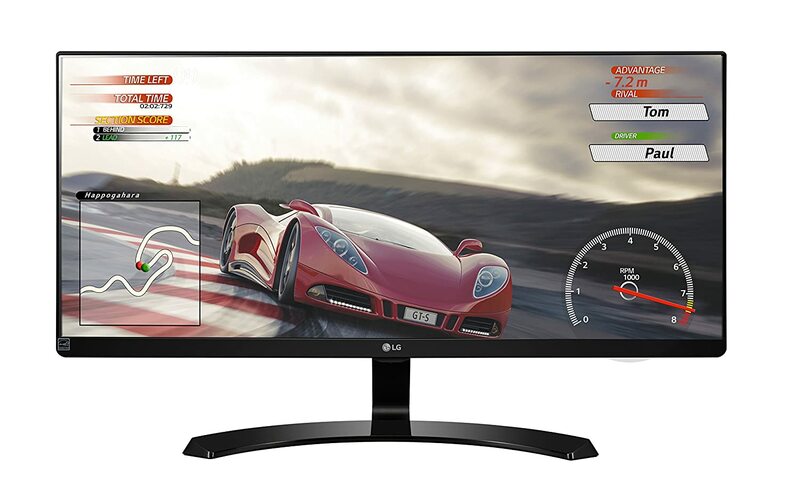 LG 29UM68-P is an absolute treat for the gamer which offers stunning image quality and accurate colors with ultra-wide resolution monitor. It comes up with an ultra-thin bezel and an arc stand which gives it a stunning look. 2560 X 1080 ultra-wide resolution. 60 Hz (75 Hz overclocked). Built-in speakers – 2 x 5 W.
Ports: 2 x HDMI 1.4, display port 1.2, audio input. It comes up with an ultra-thin screen which is covered with a matte finish helps to eliminate the sunlight reflection. The base of the monitor is exclusively covered with an arc design which gives a sleek look.LG29UM68 is basically frameless, except for the narrow black borders. In order to provide a brilliant watching experience, the black borders are neatly blended in the black background. Another exceptional feature is you will experience an immersive gaming experience with the help of IPS panel which provides an exceptional color accuracy of 99% sRGB. The on-screen control software and the joystick are located below the screen and the OSD menu settings include input selection, contrast, volume, brightness, aspect ratio, 6 axis color adjustments and gamma. Presets like the reader, photo, cinema, color weakness, the custom mode can be easily selected using the joystick. In addition to the above features, the speed of the response time and black stability features can be adjusted using the custom gaming mode and three gaming specific modes. The aspect ratio presets include wide, cinema 1, cinema 2 and original. The pixel-pitch of 0.2628mm delivers high-quality image and text clarity even with an average GPU. LG 29UM68 otherwise known as LG29UM68-P comes up with HDMI cable, power adapter, power code, an easily installable stand, cable holder and a CD with information and software. You won’t require any calibration because LG 29UM68-P is easily assembled. IPS glow-glow in the corners of the screen. 75 Hz only in free sync mode. You need to install the on-screen control software even if the monitor comes with a practical joystick. The on-screen control software allows you to adjust all important setting in a desktop application. The dual controller feature allows you to connect two or more devices and display them on one screen. In my testing, most of the gaming monitors one of the drawbacks what you can see is the slowdown performance during multitasking. Here, the screen split 2.0 feature makes multi-tasking activities faster and painless. You can choose between 14 different variations of splitting your screen, into two, three or four screens both horizontally and vertically. You can place the additional computer’s display on the either one of the four corners of LG 29UM68-P with the help of 4 different pictures in picture mode. The gameplay can be enhanced by enabling the Black stabilizer and dynamic action sync features with FPS modes and one RTS modes. The brightness and sharpness of the black color are enabled using the Black stabilizer technology when you find yourself in gloomy areas of the game. The peculiar feature in this area is the picture does not lose its quality or get uneven colors even when the picture is in a higher black color. In my gaming experience with the fast moving object, I didn’t feel any kind of blurring or ghosting experience because of quick 5 ms response time and the dynamic action sync feature. 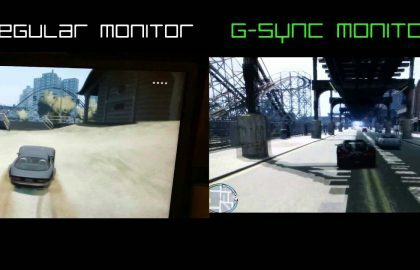 The input lag is also too minimal, ie the time monitor takes to respond your controller commands resulted in a stupendous gaming experience with stunning image quality. As per the reviews, it found that this monitor is equally fit for professional work and games. The professionals will be entirely satisfied with its image quality, exclusive multitasking features, and color accuracy. The gamers experience will be enriched on gaming presets and black level stabilizing technology. With its widescreen, 21:9 aspect ratio a less response time of 1ms LG29UM68 provides a treat and nice experience to the users.